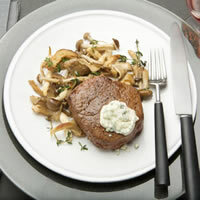 Tangy blue cheese melts over succulent tenderloin for a simple, mouthwatering combination. Variation: To grill, place steaks on grid over medium, ash-covered coals. Grill, uncovered, 13 to 15 minutes for medium rare (145°F) to medium (160°F) doneness, turning occasionally. One minute before steaks are done, top evenly with topping.